Senior executives say the main reasons new college graduates fail in the workplace are a lack of motivation or emotional intelligence, as opposed to technical skills. 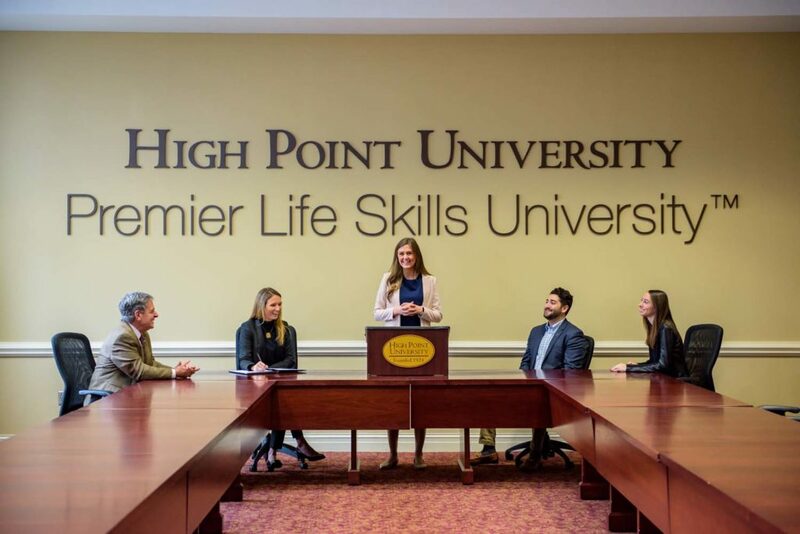 HIGH POINT, N.C., Feb. 6, 2019 – Recent college graduates need life skills to succeed in the workplace, according to executive leaders who participated in a national poll conducted by High Point University. In the online survey, HPU asked 500 C-Level executives who represent organizations with 5,000 to 25,000 employees a series of questions about their experiences in hiring recent college graduates. Throughout the survey, these executives indicated that life skills, such as motivation, emotional intelligence and the ability to solve problems, were more important to their organizations than technical skills, such as training on a specific software or subject. Sixty-five percent of executives said they’d rather colleges equip students with life skills such as motivation, emotional intelligence and the ability to solve problems, as opposed to 35 percent who said they’d rather colleges instill technical skills such as training on a specific software or subject. However, 67 percent of executives believe that today’s colleges are better at teaching technical skills as opposed to life skills. Executives said that new hires fail for reasons such as motivational skills (38 percent) and emotional intelligence (29 percent). Meanwhile, technical skills ranked near the bottom with 11 percent, and coachability (13 percent) regarding reasons new hires fail. The results align with HPU’s focus on life skills and the fact that 97 percent of HPU graduates begin careers or continue their education within six months of graduation. That’s why HPU offers robust opportunities for students to build life skills on campus, including the President’s Seminar on Life Skills for all freshmen; 1924 Prime, the university’s fine dining restaurant and learning lab; Project Discovery for students searching for the right major; access to innovators such as Apple Co-Founder Steve Wozniak, HPU’s Innovator in Residence; and Student Success Coaches. For more information on HPU’s approach to life skills and other studies, visit this website. When asked which aspect of a graduate’s resume matters, 77 percent said hands-on experiences such as internships and work experience or supervisory and leadership roles matter, while 13 percent said degree of study and 10 percent said high GPA. When these executives were asked which trait is easiest to develop in an employee, 69 percent said technical skills, compared to 18 percent who said personal initiative and 12 percent who said team player. When asked which trait is the hardest to develop in a recent college graduate, 59 percent said personal initiative, 24 percent said team player and 17 percent said technical skills. As far as work ethic in new college graduates, 71 percent of senior executives said their generation has a stronger work ethic than new college graduates. Twenty-three percent of executives said both groups have the same work ethic. Of these two sets of skills, which would you rather colleges instill in recent college graduates? Of these two sets of skills, which do you think colleges and universities are best instilling in recent college graduates? Of these accomplishments, which is most important to you on a recent college graduate’s resume? When you hire recent college graduates, what are the reasons they fail? Which trait is easiest to develop in an employee? What characteristic is the hardest to develop in a recent college graduate you hire? When it comes to work ethic in new college graduates, which of these statements best align with your beliefs? This HPU survey of C-Level executives was fielded online between Dec. 12 and 17, 2018. The responses are from 505 C-Level executives at organizations with 5,000 to 25,000 employees or more, recruited by Research Now/Survey Sampling International. The HPU Survey Research Center contracted with Survey Sampling International to acquire the sample and fielded the online survey using its Qualtrics platform. Since this online sampling is from a panel of respondents, their participation does not adhere to usual assumptions associated with random selection. Therefore, it is not appropriate to assign a classical margin of sampling error for the results. The data is not weighted. Factors such as question wording and other methodological choices in conducting survey research can introduce additional error into the findings of opinion polls. Details from this survey are available at http://www.highpoint.edu/src/files/2019/02/CLevelMemo.pdf.